It might come as a surprise, but studies suggest that over 30% of the records in your database right now are duplicates or inaccurate data. Imagine how much time your sales team is wasting managing those unusable leads. Data cleansing is the process of refining your company’s data so it’s free from errors, duplicate content, and outdated entries. In order for marketing and sales professionals to make use of raw data, it needs to be processed in a timely manner. Regular checks and scrubs on data are vital for avoiding the high costs and frequent mistakes that arise from working with bad data. One third of most companies’ data is duplicated information or corrupted. Is yours? Marketing experts say that 30% of your business’s data will become outdated, corrupt, and inaccurate within the next year. This happens for any number of reasons; customers switch their contact information, B2B contacts change companies, contacts get promoted or relocated, and profiles on target customers become outdated as more information about them becomes available but isn’t utilized. These inaccuracies in your raw data come with high costs. They can cost your marketing and sales staff untoward amounts of lost time and productivity. Not to mention the negative effects on your company’s bottom line. According to the Data Warehousing Institute, poor data quality costs American businesses up to 600 billion dollars a year. Given this large sum, it’s remarkable that more business owners aren’t paying closer attention to this serious issue. Incorrect or bad data can lead to any number of problems from bad decision making to bad business. With corrupt, inaccurate, and outdated raw data, your marketing professionals can miss new groups of potential target customers. Sales personnel can miss customer connections by dialing the wrong phone numbers or sending promotional newsletters to the wrong email addresses. Due to these missed opportunities, chances to generate more sales can be left on the table. A common solution among many marketing professionals is to gather and add more raw data without any effort to cleanse the existing data. This tactic can make the problem worse because bigger volumes of raw data are even more prone to errors. A much better approach is to deploy an efficient, user-friendly data cleansing strategy, that will ensure both new and stored data will stay free from errors or corruption. The most common challenge is to find the right software tools that are capable of scrubbing and updating all types of raw data as well as various common errors. The right data cleansing tools, like RingLead DMS Cleanse and Duplicate Prevention, will be able to source, evaluate, and process all types of data your company uses for marketing efforts, and one of these programs can be set up to perform many data cleansing tasks automatically at regular time intervals. You can set and adjust these intervals according to the numbers of new sales leads or business contacts your company generates throughout the year. 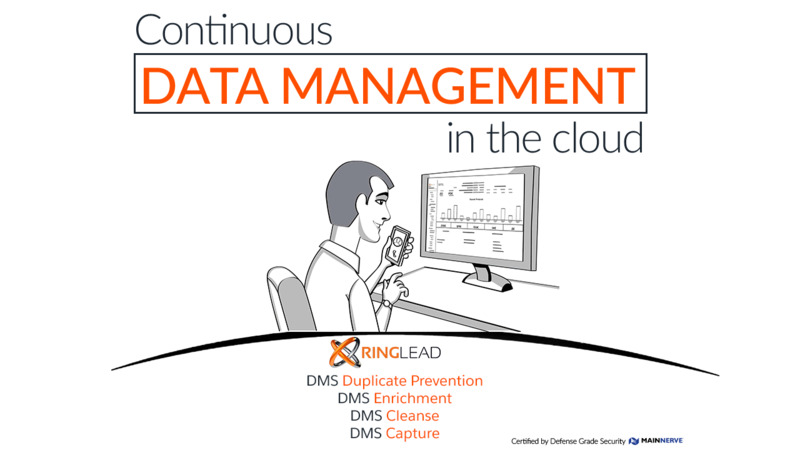 RingLead Data Management Solutions (DMS) offers a complete line of products to capture, clean, protect and enrich a company’s CRM data, leads, contacts, and accounts. Our cloud-based data management software has helped more than 2,000 different companies clean up, append, and refine their data, ensuring much better customer relationship management strategies. RingLead DMS is the only fully scalable, and complete, data management platform that will help your team generate more revenue, reduce the amount of time spent manually managing your data, and align your sales and marketing strategies. Many clients have reported that their new data strategy has allowed them to uncover new marketing opportunities they would have otherwise missed. RingLead DMS will automatically detect duplicate entries, correct errors, and standardize the format in which content is entered in a given database. By running this type of data cleansing on a consistent basis, your marketing team will find it much easier to uncover new promising sales leads and not waste time and efforts on useless leads. Watch the entire DMS platform in action today by clicking the box below to schedule a demo!